If you ever wanted to set up a home cinema, we've got you covered. 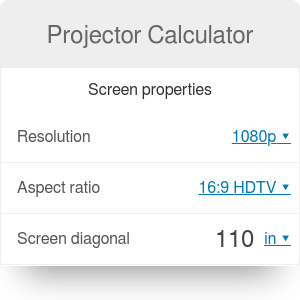 This projector calculator is a handy tool that determines the perfect viewing distance (that is, the distance between the screen and your amazingly comfortable couch), the ideal throw distance (the distance between the screen and the projector) and the optimal brightness. With our help, setting up your personal movie theater is just a piece of cake! If you came here to choose a perfect size of a TV screen, make sure to head to our TV size calculator. Your first step towards setting up a perfect home cinema is to properly calculate the viewing distance. If you're sitting too far from the screen, you will not see all the available details. On the other hand, if you're sitting too close to the screen, the whole picture might not fit in your field of view; for example, if you will be concentrating on the left part of the screen, you won't notice what's happening on the right. To find out what is the proper viewing distance, fill in the screen properties: the resolution of your movie, the aspect ratio of the screen, and its diagonal size. These three basic values are vital for determining the optimal setup of your home cinema. Minimum viewing distance: the minimum distance between you and the screen to ensure the whole picture is in your field of view. Don't place any seats closer to the screen, as it will be uncomfortable to watch the movie for the viewers. Maximum viewing distance: the maximum allowable distance between the audience and the screen according to THX (an American audio-video company). For the movie theater to obtain the THX certification, the audience must sit at this distance or closer to the screen. Optimal viewing distance (quality-wise): regardless of the field of view, this value specifies the distance between the audience and the screen that ensures you see all available detail. The higher the resolution, the closer to the screen you should sit. Hence, if sitting at the optimal distance would mean you sit too close to the screen to get the whole picture in your field of view, you can decrease the image quality without any consequences for viewing quality. Maximum viewing distance recommended by THX: apart from setting a maximum allowable viewing distance, THX also specifies the maximum recommended distance. They suggest that sitting at this (or closer) distance to the screen will result in optimal viewing conditions. Maximum viewing distance recommended by SMPTE: similarly, the SMPTE (Society of Motion Picture and Television Engineers) recommends a maximum viewing distance that should ensure optimal quality of watching movies in a home theater. Projector brightness: you can find it in the manufacturer's specifications of your projector model. It is expressed in ANSI lumens and describes how bright is the image projected by the device. Screen gain: if you use a special material for your screen, it can increase or decrease the brightness of the projected image. For example, the Stewart FireHawk screen provides a maximum gain in brightness of 1.1, and the Da-lite High Power Screen of as much as 2.8. Brightness lower than 12 fL is not acceptable, even in totally dark rooms - your audience will have problems with watching a movie that dark. You should consider a brighter projector or a smaller screen. Brightness between 12 and 16 fL is better, but still too low for dark rooms. Brightness between 16 and 22 fL is perfect for completely dark rooms. If this is the brightness level you got from our projector screen calculator, you can be proud of yourself! Brightness higher than 22 fL is recommended for rooms with some ambient light. If you plan to have a lot of light in the room, you should consider increasing the brightness even more. The third and final part of our projector throw calculator deals with the throw distance, or, in other words, the distance between the projector and the screen. To calculate it, you will need to read the manufacturer's specifications for your projector and find a value called the throw ratio. Essentially, the throw ratio is the proportion between the throw distance D and the width of the screen W. You can write it down as throw ratio = D/W. The manufacturer of each projector specifies two values: the minimum and maximum throw ratio. After you input these values into the projector calculator, you will obtain the minimum and maximum throw distance perfect for your screen dimensions. Now all you have to do is set up the home cinema according to the results you got. There's a lot more to setting up your perfect home movie theater - perhaps you want to calculate the number of seating rows, or try to ensure that the vision of audience members in the last row is not blocked. Make sure to take a look at the website of Carlton Bale, who provides a lot of helpful tips and an elaborate calculating tool, on which this projector calculator is based. Projector Calculator can be embedded on your website to enrich the content you wrote and make it easier for your visitors to understand your message.